Bal en Blanc is a huge rave party that is hosted annually, during the Easter holiday weekend, in Montreal, Quebec, Canada. It was first held in 1995, and the first event had 800 attendees. It now features headliner DJs from all over the world and attracts over 15,000 attendees. Bal en Blanc usually has two separate rooms, one catering to house music and the other to trance music. The party attracts a diversity of ravers. It usually lasts for 15 hours, from 9 pm to 12 pm. It is produced by Produkt. 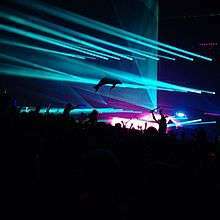 In April 2009 the party celebrated its 15th anniversary with a lineup that included Insomnia, Markus Schulz, Above and Beyond, Armin Van Buuren, Roger Shah, King Louis, Uppercut, Offer Nissim, Ana Paula, Axwell, Deadmau5 and Victor Calderone. April 2010's edition featured Ferry Corsten, Markus Schulz, Sander van Doorn, Infected Mushroom, Sied van Riel, David Guetta, LMFAO, David Morales, Kaskade and a special guest appearance from Godskitchen Boombox. The lineup in April 2011 included Tiësto, Armand Van Helden, Avicii, Hardwell, Freemasons, Yinon Yahel, Above and Beyond, Markus Schulz and Sander Van Doorn. In 2012, for Bal en Blanc's 18th edition, the lineup included Armin van Buuren, Ferry Corsten, Fedde Le Grand, Steve Angello, Jochen Miller, Danny Tenaglia, Beat Service, Markus Schulz and Ben Gold. Nadia Ali also performed live in both the Trance and House rooms. For 2013, the artists included Armin van Buuren, Ferry Corsten, Markus Schulz, W&W, Andrew Rayel and Cosmic Gate for the Trance room and David Guetta, Calvin Harris, Dubfire, Nicole Moudaber, Peter Rauhofer and Sultan & Ned Shepard for the House Room. Emma Hewitt will also perform live in the Trance room. ↑ Spector, Dan (2008). "Everyone's welcome at Bal en Blanc ...unless you show up late.". Fringe Arts. The Link. Archived from the original on 26 March 2012. Retrieved 22 June 2011. ↑ "Bal en Blanc". GrandQuebec. Archived from the original on 19 May 2011. Retrieved 22 June 2011. ↑ Sherman, Michael; Parry, Pascal. "Bal En Blanc - Montreal's Great White Party - Review of 2010". Edit International. Retrieved 22 June 2011. ↑ Ballivy, Violaine (April 2009). "Bal en blanc: 12 arrestations". Actualités - Régional. Cyberpresse. Retrieved 22 June 2011. Wikimedia Commons has media related to Bal en Blanc.